Inspiration–how do you like yours? So, today I thought I might blog about inspiration. I think many people, when they come to write, are worried about whether their inspiration is the ‘right’ kind, or ‘good enough’. I mean, we’ve all read about those people who get their inspiration deep in meditation on top of a mountan in Brazil–but my muses aren’t that fancy. In my humble opinion (ok, ok, my opinion in generally not very humble), there is no right or wrong when it comes to inspiration. The inspiration I received for my first book, The Enemy Inside, was so persistent that it almost drove me mad. I was working in the PR job from hell at the time (I’m not sure my boss was actually Satan, but at the very least she was Satan’s number one wife). Every morning I used to hope to get hit by a bus so I wouldn’t have to go to work. But every night, I would go to sleep and dream that I was writing the first chapter of this book. Over and over again, every single night. Now usually, when I inspiration dream, it’s generally in movie-length, vivid epic complete with casting, sets and costumes. But this was different, in that instead of me either being IN the epic, or closely observing it, this time I was writing it. It got to the point where I knew the entire first chapter by heart! Those muses are darn persistent. Eventually, I got the shits with this—I mean, I had enough going on doing Satan’s bidding without missing out on sleep at night too! So I thought that if I just sat down and wrote out this chapter, that it would get out of my head and I could get on with being miserable in my crap job that I hated. I always had the bus to look forward to, after all. But hey, what do you know, the rest of the book came out after this first chapter, and I had written it in about a month. I loved writing so much I quit my job and starting writing as much as possible in between doing freelance writing work. Now, while the book has changed quite a bit and details have been added, Chapter 1 is still very similar to that very insistent dream. Many people may think it’s pretty naff to say you were inspired by a dream, but we are now so busy in our daily lives, that, frankly, I have no idea how the muses would ever reach us if it wasn’t for sleep. Apart from really inconvenient moments, like meetings, intimate dinners and parties, I still mostly get inspired by my muses while I dream, and as a result I keep a notepad by the bed to jot it all down (no, you will never remember it in the morning—write it down there and then!). 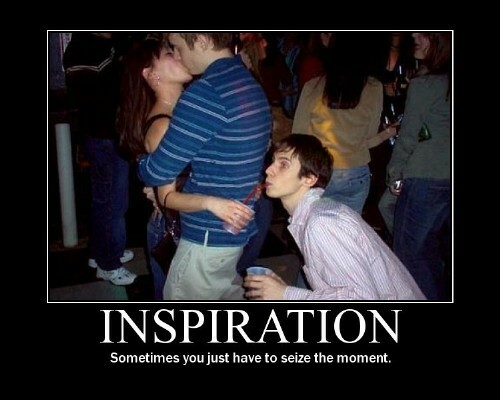 So that’s my story, may the inspiration be with you. This entry was posted in Uncategorized and tagged crap job, gaming, literature, writing.